At such a low price, Samplr is a must-have. Impressive multi-touch functions. Six simultaneous samples. Effects. We take a look at Samplr, a new must-have multi-touch music-making app for iPad and iPad Mini. Now that Apple's iOS has matured into a serious platform for music- makers, certain trends have become apparent. "The common thread that links most of our favourite apps is that they take advantage of the iPad's multi-touch capabilities"
We've been impressed by all kinds of apps from cheap utilities through to expensive controllers and full-blown DAWs, but the common thread which links most of our favourites is that they take advantage of the multi-touch capabilities of Apple's devices, offering functionality which would be impossible to achieve on nearly every other platform. 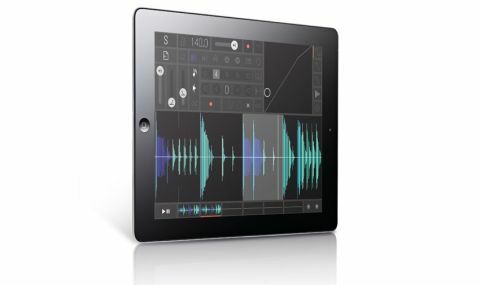 Marcos Alonso's Samplr for iPad and iPad Mini leaps straight onto our list of must-have music apps. As the name suggests, this bargain-priced app focuses on sampled audio, allowing recordings to be manipulated in real-time by sliding fingers across waveform patterns on the screen. The results are immediately impressive. Samplr's seven multi-touch play modes each offer different approaches, all of which are useful and genuinely musical - Slicer mode, for example, chops a sample into segments to be played back individually; E-bow mode offers a basic form of granular synthesis. This in itself would be impressive, but the fact that six samples can be loaded simultaneously - each with six-voice polyphony - turns Samplr into a self-contained sample-based composition tool. Load drums and instruments into separate slots and you can build up multi-layered loops and patterns. Five effects (which operate on individual samples rather than across the entire output) provide the icing on the cake, allowing each sound to be treated with processing options including a filter, distortion and reverb.